The Muck Boot Chore Series provides dry, comfortable footwear that's built to handle the toughest job. The Steel Toe boot features a 5mm NEOPRENE bootie with four-way stretch nylon, is 100% waterproof, lightweight and flexible. 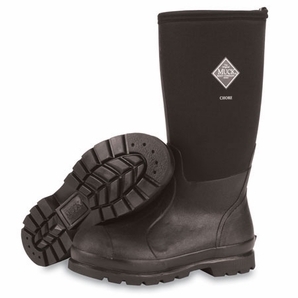 The Neoprene work boot's stretch-fit topline binding snugs calf to keep warmth in and cold out.Meets ASTM F2413-11 M I/75 C/75 EH.